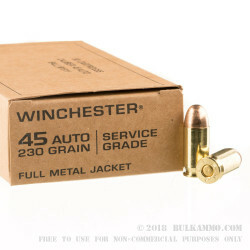 Avid shooters of 1911s and other .45 ACP pistols will appreciate the dependable performance and (relatively) low price of this ammo from Winchester. 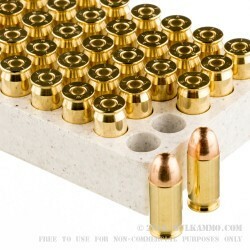 Each cartridge in this bulk packaged case of 500 fires a 230 grain full metal jacket bullet at 865 feet per second. This combination produces ballistics comparable to those of mil-spec ammo, hence the name "Service Grade." 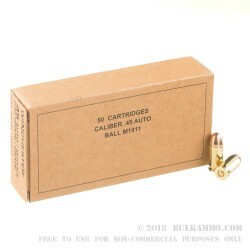 These cartridges use non-corrosive Boxer primers, brass cases, and a standard pressure powder charge, making them ideal for use in older 1911s not suited for +P ammo. Ammo shot fine but was filthy. 150 rounds through a brand new gun, it looked like I hadn’t cleaned it in months. Since then I have run Blazer, Tula, American Eagle and Freedom with far less fouling. Pricewise it’s OK but there are better deals on better ammo. Purchased 500 rounds of this a few weeks back and i can't believe how fast the shipping was, never had a misfire or Jam, running this through a PPQ .45. Since i placed this above order, i have also ordered 1000 rounds of 9mm and 1000 more rounds of .45 ACP. I am very pleased with this ammunition. It works flawlessly in my firearms. I highly reccomend it. Bought 500 rounds. Got a phone call confirming it was me who ordered due to different shipping and billing address. EXCELLENT looking out for customer. Shipped super fast!